Bet you immediately thought about a guest book at a wedding or funeral. There are those, but that’s not the guest book I mean. I’m talking about guest books like the one that lives on the chest in our entry. Our smiling faces are first thing to greet all guests to our home, but everyone who visits us is asked to sign our guest book before leaving. Of course, we don’t limit cead mile failte welcomes to Irish only. As you can see in the picture, the plaque is there for all who wish to read. This is actually our second guest book. The first book ran out of pages before we left Houston. I rarely look back at the guest book from our wedding and have never looked over the attendees who signed the funeral books from my parent’s services. However, I do go through our home guest books periodically. And, I smile from fond memories of time spent with friends. Have you visited someone and signed their guest book? Do you have a guest book for you home? If not, and you’re interested in starting to use a guest book, there are some great ideas on Pinterest. 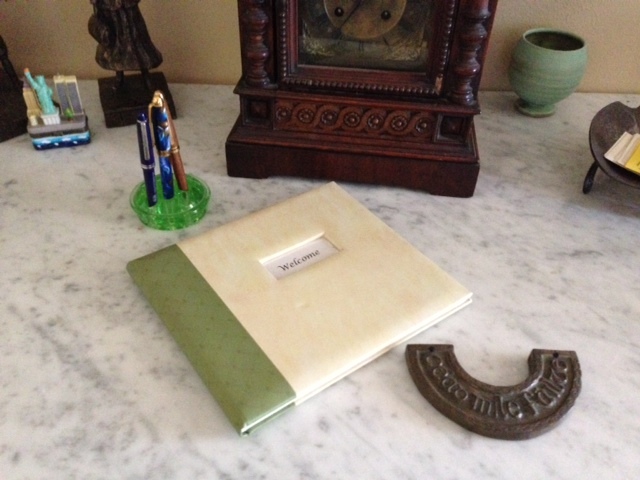 Most of the ideas are for wedding guest books, but are easily adapted for home guest books.